If there’s one dish that I must have on Thanksgiving, it’s stuffing. I like sweet potatoes, but don’t need them. Mashed potatoes always seem a bit superfluous to me. Even turkey is negotiable. But stuffing, with its play of textures and flavors — is the heart of Thanksgiving dinner. Last year I told you about the sacred sage stuffing that my family makes every Thanksgiving. I stand by that recipe. But if, for some reason, you need another stuffing recipe — like you’re going to two Thanksgivings, or your aunt Patricia is already making that stuffing and you need to bring a second one, or you’re having an all-stuffing Thanksgiving meal (what? It could happen!) 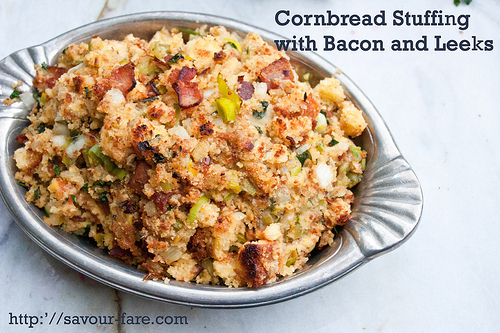 — I came up with crockpot cornbread stuffing for you. I have heard that some people prefer cornbread stuffing, so I thought I’d offer that as an alternative to the sacred stuffing. If you make it yourself, you can vary the sweetness – I took the lazy sane way out and bought some from the bakery section of the local market. Since cornbread is often on the sweet side (don’t shoot, southerners!) I thought it would be nice to balance out the sweetness with leeks (probably my favorite member of the onion family) and bacon (because, really, why not?) And then, just to get all crazy on you, I cooked it in the crock pot. Why the crock pot? Because I don’t know about you, but my oven is often full on Thanksgiving day of things that cannot be cooked in the slow cooker, like pie and the aforementioned turkey. And the slow cooker is a wonderful invention for keeping things moist, which stuffing must be (to get a crisp top, run the cooked stuffing under the broiler for a minute or two. The verdict? It’s not the sacred stuffing, but it’s pretty darn good. Cut the cornbread into cubes, saving all the crumbs and collecting the whole thing in a large bowl (or in your crockpot crock). Cut the bacon into roughly 1 inch pieces. In a wide, deep skillet (I use a Calphalon everyday pan, which is roughly wok-like), fry the bacon until crisp. Remove the bacon and set aside, but retain the bacon grease in the pan. Melt the butter in the pan with the bacon grease. Add the celery, onions, leeks and thyme and cook over medium heat until the vegetables are softened and translucent. Pour the entire vegetable mixture over the cornbread, add the reserved bacon and the parsley, and toss until the bread is coated with the mixture. Put the bread mixture into the crockpot and pour the chicken broth over it. Cook on high 1-2 hours, or until hot throughout. Serve in an oven-proof pan and run under the broiler for a few minutes to crisp before serving. Stuffing is definitely my favorite part of Thanksgiving. I’d never thought to cook it in the crock pot – how smart! Would love to feature this in a round-up of slow cooker stuffing, just your photo and link. Hope that is okay. Feel free to delete this comment! Do you need to dry out the cornbread prior to adding to the crockpot? If your cornbread is super fresh or moist it might be a good idea. I just cut it up and let it sit out for an hour or two. If its a drier style, no need!